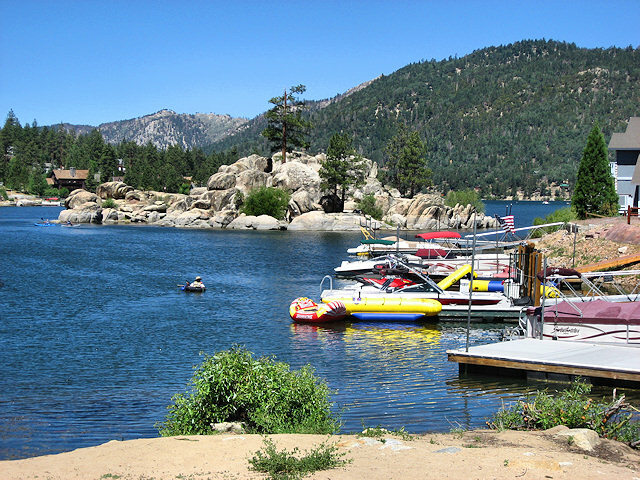 It is not too late to plan a trip to Big Bear Lake for the July 4th Weekend! We have some awesome cabins still available. Visit our website at RSVacations.net for easy, online booking before they are all gone! Skies are still clear here in Big Bear with the majority of smoke from the ‘Lake Fire’ blowing away from the valley. This fire does not currently pose an immediate threat to the Big Bear area. Temps will remain in the 80’s with clear skies throughout the weekend and into next week. Please follow us on Facebook where we are continually providing up to date information and photos about the ‘Lake Fire’. There are a few things going on around Big Bear this weekend, including an Eagle’s Tribute band playing live at The Cave and the 12th annual Carp Roundup. See the flyer below for all the details. Sunday is Father’s Day, so why not surprise Dad with a quick weekend trip to Big Bear? Sign him up for a Fishing Charter, a round of Golf, or a Jet Boat Ride! There are plenty of fun, family activities going on this weekend and all summer long! Come on up and Beat the Heat!! RS Vacations still has cabins available, and with off season pricing and special discounts still in effect, it is the perfect time to join us! 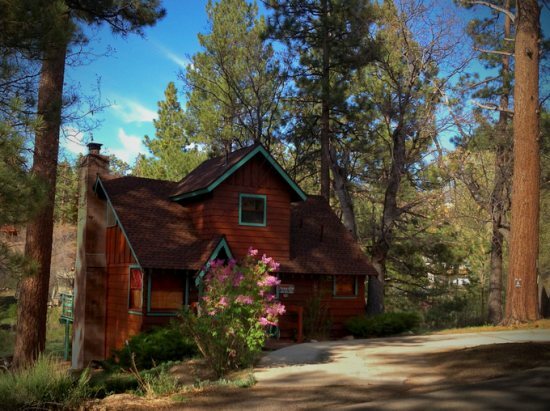 Book your Big Bear Cabin Rental TODAY! We are starting to fill up for the coming July 4th holiday weekend, but we still have several cabins to choose from. 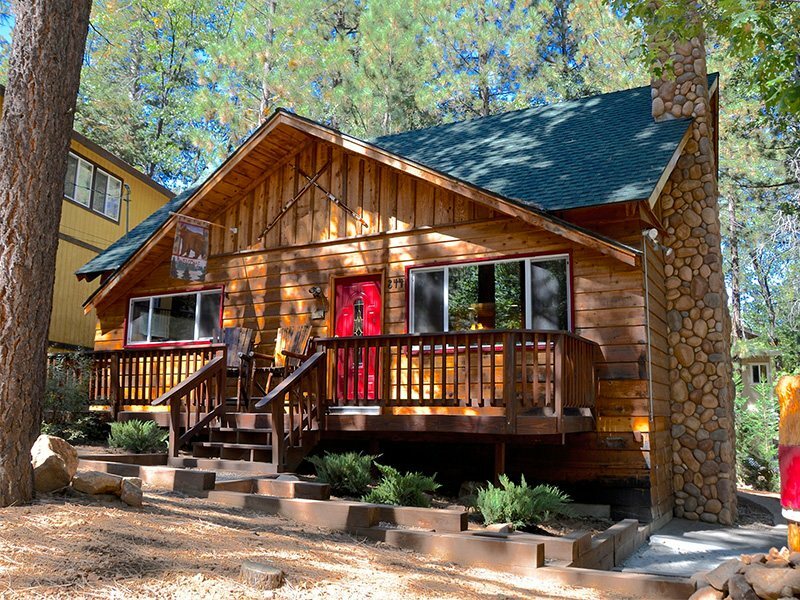 Visit us at RSVacations.net and book your Big Bear Cabin for Independence Day before they are all gone! Book today! 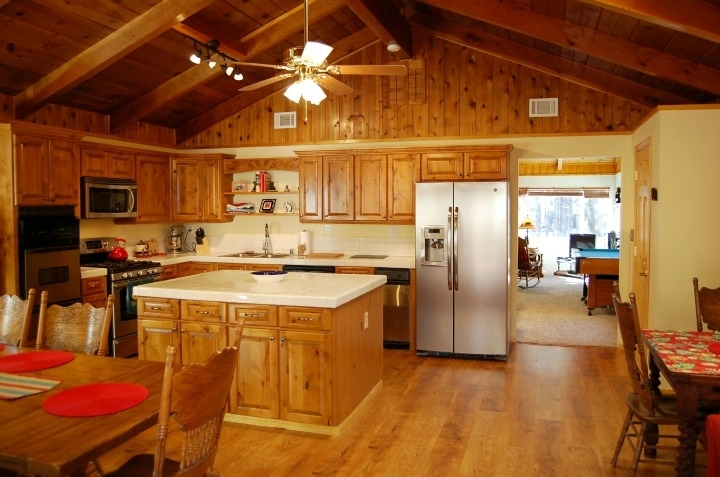 Enjoy a getaway to this beautiful log cabin nestled in the pines that is only 3 blocks from Snow Summit Mountain Resort. Bearlagio is truly a treat with its warm and comfy living room with wood burning fireplace and lovely mountain decor, and adjacent fully appointed kitchen and dining. The first floor also has two bedrooms with a queen size bed in one room and two twin beds in the other. A full bath and full size washer and dryer are available for your convenience.Walk up the stairs that open to a loft with daybed and trundle for added sleeping. 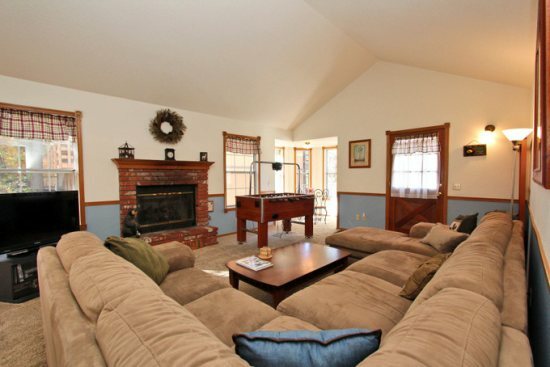 The kids will love the Teepee to play in and kids of all ages will enjoy a game of foosball. Relax in the private jacuzzi tub in the master bath and dream the night away in the lovely master suite with a luxurious queen size bed. The spacious wrap around deck has a BBQ and new spa for your enjoyment. The large backyard is perfect for making your own snowman in the winter. Relax and rejuvenate at beautiful Bearlagio! View more photos, check availability and book Bearlagio online at RSVacations.net today and treat yourself to a Luxurious Big Bear Lake Vacation. It looks like it is going to be another gorgeous, summertime weekend in Big Bear Lake with highs in the upper 70’s and beautiful blue skies for the weekend after a chance of thunderstorms this afternoon. A great alternative to the June Gloom down the mountain! Come on up!! 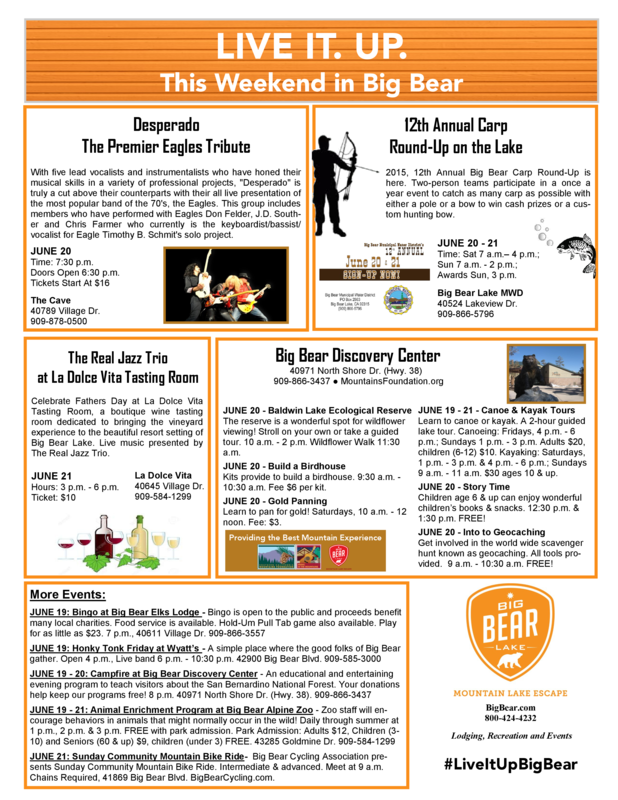 Besides the hundreds of activities that Big Bear offers, we have a few special events this weekend. The Old Miner’s Big Bear Heritage Parade makes its way down Big Bear Blvd. on Saturday the 13th from 11:00 AM to 12:00 Noon. 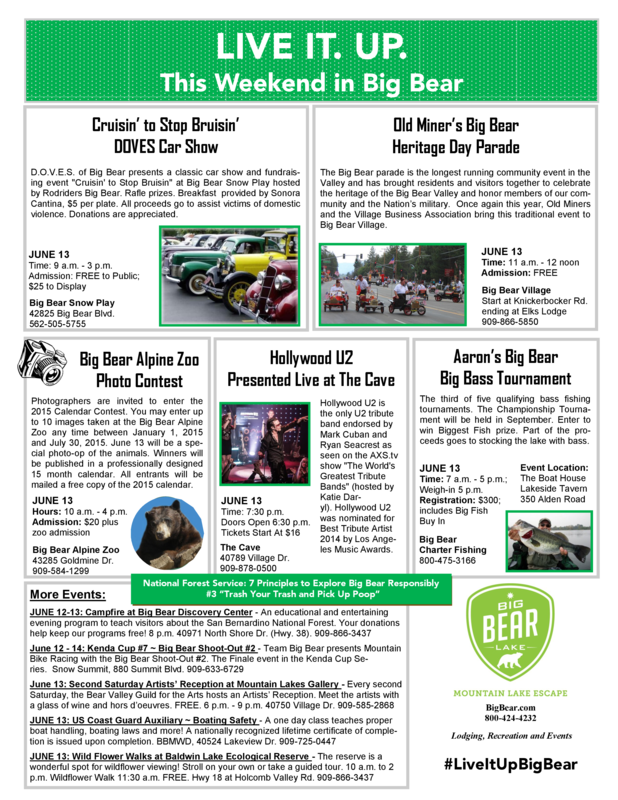 Saturday also brings us the Big Bear Alpine Zoo Photography Contest which takes place during 10:00 AM and 4:00 PM as well as the Cruisin’ to Stop Bruisin’ DOVES Car Show and Fundraiser at Big Bear Snow Play from 9:00 AM to 3:00 PM. You can get more information on that event from my Tuesday post HERE. Also, be sure to check out the newest fun thing to do in Big Bear – The Big Bear Speedway, where you can try to beat the clock in go-carts that reach up to 30 MPH!! This fun activity is also located at Big Bear Snowplay. Bob will be checking it out this weekend, so I plan to post more information and photos on my next Tuesday’s Topic post. Stay tuned! 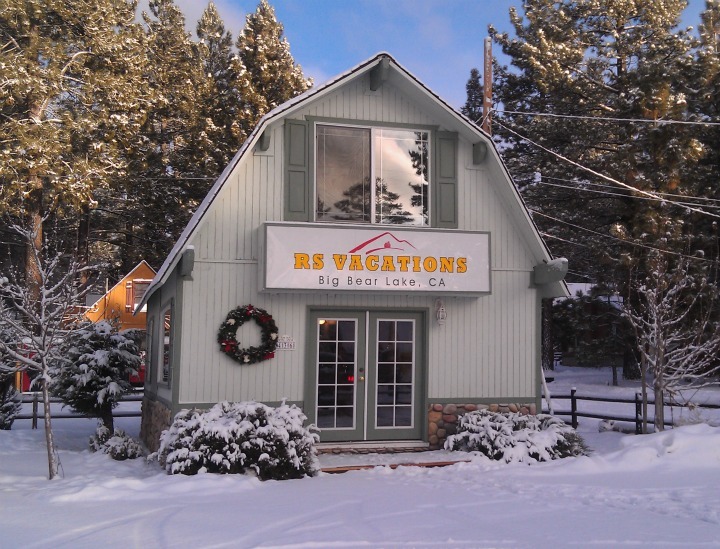 We know that there are a lot of choices when you are getting ready to book a cabin in Big Bear, but we want you to know that when you book with RS Vacations, you will experience the very best in customer service. 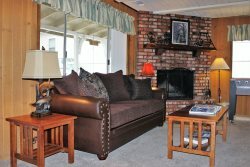 You can look forward to a quick and easy, secure reservation process, fast and personal answers to questions along the way, going straight to your cabin upon your arrival in Big Bear, a clean and well-stocked cabin and a 24 hour, local Property Manager to handle anything unexpected – immediately and professionally. You WILL notice the difference when you stay with us! Visit our website at RSVacations.net and take a look at our wide variety of cabins of all sizes and in all price ranges. You can contact us at any time with questions and book securely online or over the phone. 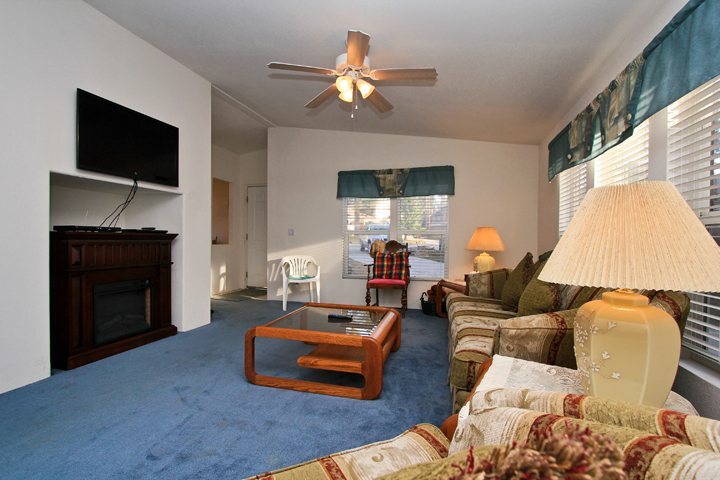 Let us help you plan your next trip to beautiful, Big Bear Lake!! 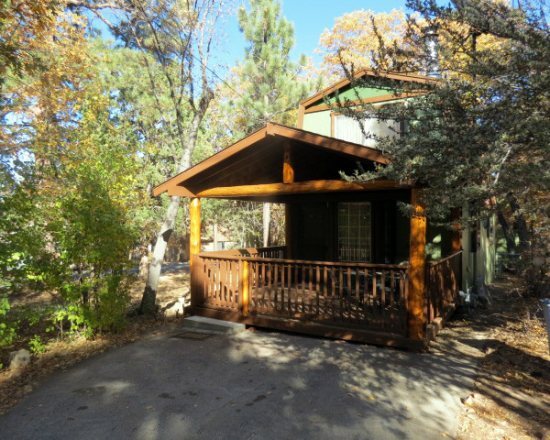 Book your Big Bear Cabin today! 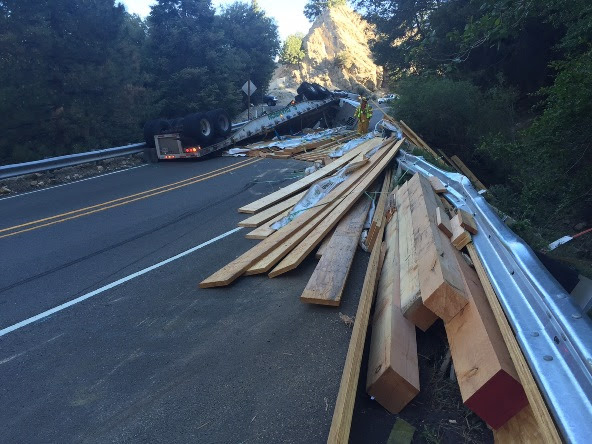 Shortly after 7:00 a.m. this morning, a big rig carrying lumber overturned on Highway 38 approximately 5 miles east of Angelus Oaks. As a result, there is a hard closure in place on Highway 38 from Angelus Oaks to Lake Williams. The closure is anticipated to last 4-6 hours. Information will be updated as it becomes available as crews work to remove the truck and debris from the roadway. Wild Wednesday: Spring Savings ending soon! and enjoy great savings on already low, spring pricing! HURRY!! Our spring special ends on June 25, 2015! Did you know that 1 in 4 women will experience domestic violence in their lifetime? Or that over 3 million children witness domestic violence in their own homes every year? Those numbers are staggering to me and make me both sad and angry at the same time. 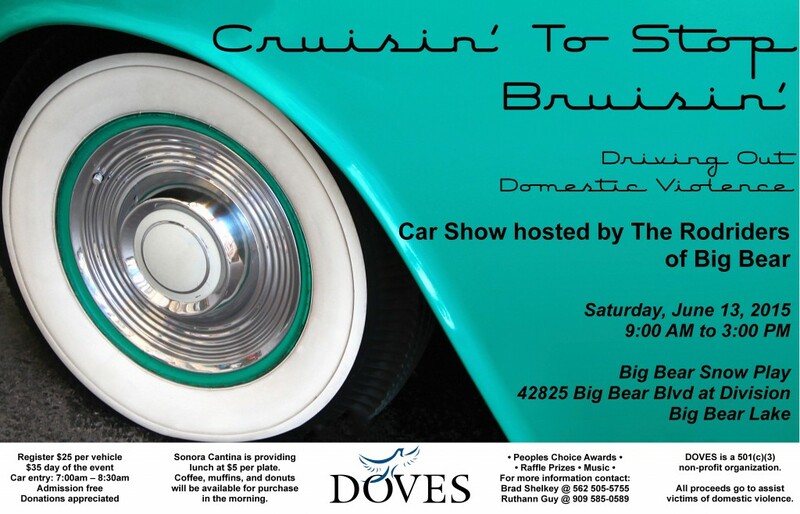 Here in Big Bear, we have a wonderful organization that is dedicated to both helping victims of domestic violence and educating the community about it: DOVES – Domestic Violence Education and Services. DOVES is a non-profit organization that depends on donations from people like you and me to continue its services in our community. They often have special events to raise money and awareness to help accomplish it. This weekend, they are having a car show called Cruisin’ to Stop Bruisin’ at the Big Bear Snow Play parking lot. There will be classic cars, music, food, raffle prizes and more. Admission is free, however donations are accepted (and encouraged!). Do you have a classic car that you would like to show? You can help out that way as well! See the Flyers below and to the left for more information. Thank you! Come on out and enjoy a day of fun with the family while helping out a wonderful and very important cause. 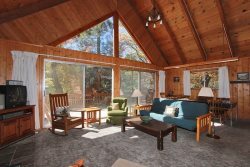 If you need a cabin, visit us at RSVacations.net. We still have our spring rates and specials in place. 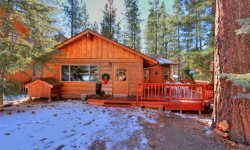 Book your Big Bear Cabin today!